We previously demonstrated that chronic pulmonary infection with Cryptococcus neoformans results in enhanced allergic inflammation and airway hyperreactivity in a rat model. Because the cell wall of C. neoformans consists of chitin, and since acidic mammalian chitinase (AMCase) has recently been implicated as a novel mediator of asthma, we sought to determine whether such infection induces chitinase activity and expression of AMCase in the rat. We utilized a previously-established model of chronic C. neoformans pulmonary infection in the rat to analyze the activity, expression and localization of AMCase. Our studies indicate that intratracheal inoculation of C. neoformans induces chitinase activity within the lung and bronchoalveolar lavage fluid of infected rats. Chitinase activity is also elicited by pulmonary infection with other fungi (e.g. C. albicans), but not by the inoculation of dead organisms. Enhanced chitinase activity reflects increased AMCase expression by airway epithelial cells and alveolar macrophages. Systemic cryptococcosis is not associated with increased pulmonary chitinase activity or AMCase expression. Our findings indicate a possible link between respiratory fungal infections, including C. neoformans, and asthma through the induction of AMCase. Asthma is the most common chronic illness in childhood, and rates of disease are highest in urban areas including the Bronx. Fungal infections including Aspergillus fumigatus and dermatophytic infections can exacerbate asthma symptoms in certain patients [1, 2]. Previous studies from our laboratory demonstrate that sub-clinical pulmonary infection with Cryptococcus neoformans, a fungus present in high concentrations in pigeon guano, induces increased airway reactivity in a rat model . Interestingly, we have also demonstrated that sub-clinical C. neoformans infection is common among Bronx children, a cohort with an extraordinarily high rate of asthma, suggesting a potential role for this type of infection in asthma pathogenesis . Nonetheless, the mechanisms by which chronic infection by C. neoformans and other fungal organisms could lead to asthma are unknown. Acidic mammalian chitinase (AMCase) has emerged as an important mediator of allergic asthma in both animal models and in humans [5–7]. Chitin, the 2nd most abundant polysaccharide in nature and the substrate of AMCase, is found in fungal cell walls, the exoskeletons of insects and crustaceans, and parasitic nematodes, prompting some investigators to hypothesize that mammalian chitinase might contribute to the pathogenesis of allergic immune responses including asthma. Evidence from their laboratory demonstrates that over-expression of IL-13 induces endogenous AMCase activity and results in airway hyperreactivity , and that blockage of AMCase activity attenuates the response. Additional investigators have linked human asthma to specific polymorphisms of AMCase . In the current study, we sought to determine whether pulmonary cryptococcosis induces endogenous chitinase activity and AMCase expression in the rat. We utilized our previously-established protocol to induce chronic infection . Briefly, male Fischer 344 rats weighing 200–250 grams (6–8 weeks of age) were obtained form Taconic Farms (Germantown, NY). Rats were infected intratracheally or intraperitoneally with either 1 × 107yeast or PBS as a control. Studies were also done with Brown Norway and Sprague Dawley rats. In some experiments, C. neoformans was killed in 70°C for 30 minutes prior to inoculation. All animal work was carried out with the approval of the Animal Use Committee at the Albert Einstein College of Medicine. Based on previous experiments, C. neoformans, American Type Culture Collection (ATCC) strain 24067 was used to establish infection . In addition, C. albicans ATCC strain 200498 was used in certain experiments. Yeasts were grown in Sabouraud's broth at 30°C for 2 days, washed with PBS and counted using a hemacytometer prior to inoculation. At different times following inoculation, rats were killed by inhalational exposure to CO2. Tracheas were cannulated with a 16 G angiocath and lungs lavaged with 3 ml of PBS four times. Following BAL, the right lung was removed, homogenized in 5 ml of PBS, centrifuged and frozen in -80°C until analysis. Lung homogenates and BAL fluid (BALF) were inoculated on Sabouraud's agar plates and incubated at 37°C for 72 hours. Colonies were then enumerated. Fungal burdens were log10 converted and averaged. For the lungs, fungal burden was expressed per lung. For BAL, fungal burden was expressed per ml. Chitinase activity assay was performed utilizing an established protocol . Briefly, BALF and whole lung homogenates were incubated with 4-methylumbelliferyl-D-N,N'-diacetylchitobioside (Sigma), which is cleaved by bioactive chitinase, thereby releasing a quantifiable fluorogenic substance, 4-methylumbelliferone (excitation 350 nm; emission 450 nm). Bioactive chitinase from Serratia marcescens (Sigma) was used for standard measurements. In some experiments, chitinase activity in the supernatant of C. neoformans cultures was measured. BALF and lung homogenates from animals were pooled by infection status and time of infection. Ten microliters of the combined samples were separated with a 10% polyacrylamide gels under denaturing conditions and transferred to nitrocellulose. Western blots were performed with a rabbit polyclonal antibody against AMCase (1:500, a generous gift from Dr. Jack Elias, Yale University) and GAPDH (1:2000, Santa Cruz Biotechnology, Santa Cruz, CA). The secondary antibody for both primary antibodies was a peroxidase-labeled goat anti-rabbit IgG (Southern Biotechnology Associates, Birmingham, AL) at a dilution of 1: 2500 for GAPDH detection and 1:5000 for AMCase detection. Bands were visualized using enhanced chemiluminescense according to the manufacturer's instructions (SuperSignal, Pierce Chemicals, Rockford, IL). Reactivity at 50 kDa, the approximate molecular weight of AMCase, was used to indicate AMCase expression . Densitometry measurements of western blots were obtained with Image J software (NIH), and values were normalized to GAPDH. Results were reported in arbitrary units. Lungs were fixed in formalin, embedded in paraffin, and subsequently processed for immunohistochemical analysis as described previously . Briefly, 5 μm sections were deparaffinized in xylene and rehydrated in graded concentrations of ethanol. Antigen retrieval was performed in a pressure cooker using 6.5 mM sodium citrate (pH 6.0). Sections were incubated with rabbit polyclonal antibody directed against AMCase (1:100, Dr. Jack Elias, Yale). Staining was visualized utilizing a commercially available kit (Santa Cruz). Negative controls were stained simultaneously with omission of primary antibody. Student's T-test was used to compare individual differences in chitinase activity between infected and control animals. For multiple comparisons, one-way analysis of variance testing was used. Post-hoc testing was done using the Dunnett test. Differences between groups were considered significant at p < 0.05. All rats inoculated with C. neoformans and C. albicans were actively infected at the time of chitinase determinations. Two days following intratacheal inoculation average log10 fungal burdens in BAL (per ml) and lung (per entire right lung) were 4.42 ± 0.01 and 6.48 ± 0.01, respectively Fourteen days following intratracheal inoculation the average log10 fungal burdens in BAL and lung were as follows: 3.97 ± 0.19 and 6.33 ± 0.03. At 2 months, the average lung fungal burden was log10 5.4 ± 0.02 (BAL was not tested). At 2 days following intraperitoneal inoculation the average log10 fungal burden in the lung was 4.5 ± 0.04, however the fungal burden in the BAL was below the limits of detection (log10 2). For rats intratracheally infected with Candida albicans the log10 fungal burden lung was 4.39 ± 0.06. No fungus was detected in the BAL limits of detection log10 2. Fungus was not detected in rats inoculated with heat-killed organisms. As demonstrated in Figure 1A, a >2-fold increase in BALF chitinase activity was present as early as 2 days after intratracheal inoculation of C. neoformans. Similar chitinase activity was also present in the BALF of rats inoculated with C. albicans. Although chitinase activity appeared to be increased in the BALF of rats inoculated with heat killed C. neoformans on day 2, this increase was not statistically significant. Intraperitoneal inoculation of C. neoformans did not result in increased chitinase activity in BALF. No differences in chitinase activity were detected in whole lung homogenates on day 2 (Figure 1B). Early chitinase activity in BALF and whole lung (Fisher rats). 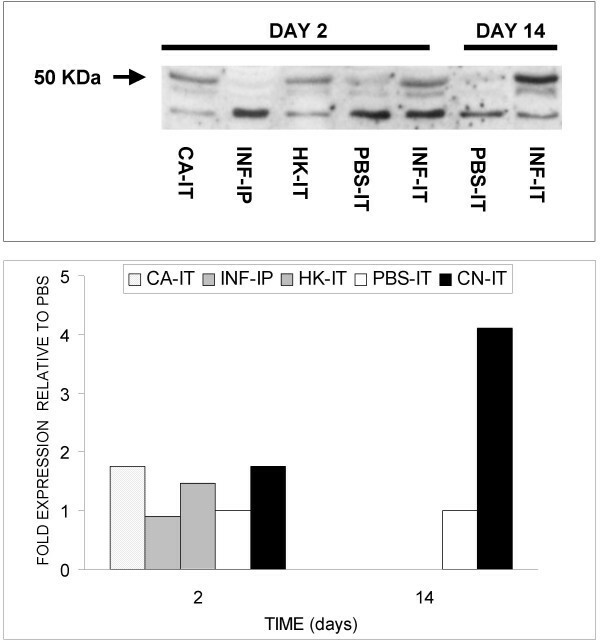 A) Two days following inoculation, chitinase activity was increased in BALF from rats intratracheally infected with C. neoformans (INF-IT) and C. albicans (CA-IT) when compared to controls. Rats inoculated intraperitoneally with C. neoformans (INF-IP) did not manifest an increase in BALF chitinase activity. Rats inoculated intratracheally with heat-killed C. neoformans (HK-IT) did not demonstrate statistically significant increase in BALF chitinase activity. B) Chitinase activity remained elevated in the BALF on day 14 of infection (BAL-INF) when compared with controls (BAL-PBS). In addition, an increase in whole lung chitinase activity was noted in infected rats (LUNG-INF; n = 4–5 rats/group; *p-value < 0.05 vs. controls). Interestingly, 14 days after single intratracheal inoculation with C. neoformans, both BALF and whole lung chitinase activity from infected animals increased to >6-fold compared to controls (Figure 1B). In contrast, chitinase activity was not detected in either BALF or lung homogenates 14 days after inoculation with heat-killed C. neoformans. 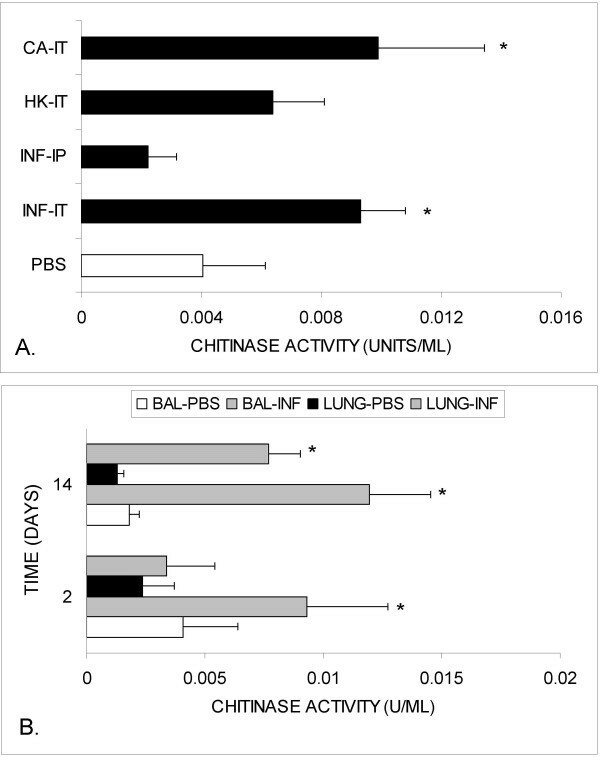 At 2-months of infection, chitinase activity remained elevated in BALF (3.5-fold) and whole lung homogenates (>2-fold) relative to PBS-inoculated animals (Figure 2). To insure that the observed chitinase activity was not due to fungal expression of chitinase, we tested cryptococcal culture supernatatants at multiple times following inoculation (days 1, 3, and 7). The density of organisms in culture by day 3 was approximately log10 7.30 ± 0.04 per ml. No chitinase activity was detected. Persistent chitinase activity in BALF and whole lung. Two months following intratracheal infection with C. neoformans, chitinase activity remained increased in both BALF and whole lung homogenate from intratracheally infected animals compared to controls (n = 4–5 rats/group; *p-value < 0.05 vs. controls). We repeated experiments with Brown Norway and Sprague Dawley rats because of their known tendencies to exhibit different degrees of TH2 polarization and allergic inflammation in response to antigenic stimulation [11, 12]. At 2 weeks, chitinase activity was increased in the both the BAL and lung homogenate of infected rats relative to PBS-inoculated animals, regardless of rat strain (Table 1). Chitinase activity (units × 10-3/ml) in different rat strains following experimental pulmonary cryptococcal infection. Values represent means ± 1 SD. For all experiments 4–5 animals were used per group and measurements done at 2 weeks. * P < 0.05 for comparison between infected tissues and PBS-inoculated controls. **TH bias of rat strain reflects tendency to develop TH1 (cellular) versus TH2 (humoral/allergic) inflammation in response to infection or antigen challenge. Because we observed significant increases in generalized chitinase activity in both BALF and whole lung from infected rats, and since several chitinase family members exhibit enzymatic activity, we sought to determine whether the specific expression of AMCase was induced by C. neoformans infection. 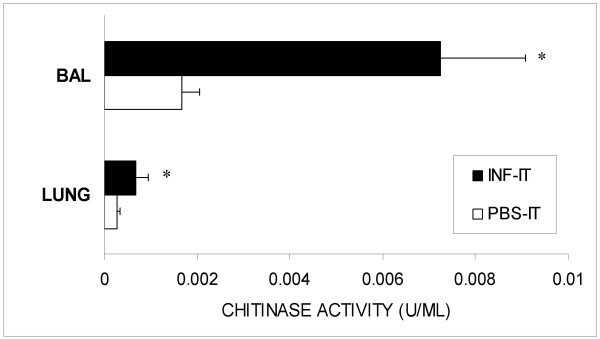 As demonstrated in Figure 3, the pattern of AMCase expression paralleled chitinase activity. Specifically, increased AMCase expression was elevated in BALF as early as 2 days following intratracheal inoculation with both live C. neoformans (1.8-fold) and C. albicans (1.8-fold) compared with controls. There was no observable difference in AMCase expression with systemic infection. Also consistent with chitinase activity data, the increased AMCase expression in BALF persisted at day 14 (4-fold increase). Lastly, AMCase expression was not detected in lung homogenates at Day 2, but was clearly increased at day 14 compared to controls (7.3-fold corrected for GAPDH, data not shown). AMCase expression in BALF. Western blot analysis and densitometry of BALF demonstrated that AMCase expression parallels general chitinase activity. CA-IT, INF-IT, HK-IT and PBS-IT refer to rats intratracheally inoculated with C. albicans, C. neoformans, heat-killed C. neoformans and PBS respectively (each lane = pooled sample of 6 animals). For densitometry analyses, readings were normalized to GAPDH signal prior to comparison with values obtained from PBS-inoculated animals. As demonstrated in Figure 4, control animals demonstrated little signal in airway epithelium. In comparison, AMCase expression was seen at day 14 and at 2-months in airway epithelium (black arrows) and alveolar macrophages (white arrows). Immunostaining for AMCase expression. A) Immunostaining for AMCase expression revealed minimal reactivity in the lungs of controls. B) Intense signal was demonstrated in airway epithelium (black arrow), particularly after 2 months of infection. C) Similar expression patterns in the airway epithelium (black arrow) and alveolar macrophages (white arrow) were also seen at 2 weeks. Original magnification 200× for all photomicrographs. Inset shows high magnification (original magnification 1000×) of immunoreactive cells that appear to be alveolar macrophages. To our knowledge, ours is the first investigation to demonstrate that intratracheal infection with C. neoformans induces generalized chitinase activity in BALF and lung homogenate from rats. Furthermore, we describe that this activity persists with chronic pulmonary infection, but is not present with systemic infection. We also demonstrate that increased AMCase expression in airway epithelial cells and alveolar macrophages parallels generalized chitinase activity and is consistent with previous investigations [5, 13]. C. neoformans is well known for its tendency to elicit allergic inflammation in animal models . In previous studies, we have shown that pulmonary cryptococcosis not only elicits allergic inflammation, but also promotes both allergic inflammation in response to other antigen exposures and non-specific airway responsiveness . The pathogen specific factors that lead to allergic inflammation are not well understood, but several investigators have focused on the role of the cryptococcal polysaccharide [15, 16]. Our study suggests that induction of AMCase by C. neoformans is another mechanism that may promote allergic inflammation. Importantly, additional proteins with chitinase activity have also been discovered in both rodents and humans, including BRP-39 (mouse), YKL-40 (human) and chitotriosidase . While our investigation suggests that the increase in generalized chitinase activity in the rat is partly due to over expression of AMCase, we are unable to determine whether BRP-39 and chitotriosidase are similarly upregulated. Chitin is a major constituent of the fungal cell wall so it is not surprising that induction of chitinase and AMCase were also observed with C. albicans. Interestingly, sustained induction of chitinase activity was not observed with inoculation of heat-killed organisms suggesting that active infection is required for chitinase and AMCase induction. It is not clear whether this difference in chitinase induction reflects a qualitative or quantitative difference in exposure. Future studies will focus on the role of infection-induced epithelial damage in promoting chitinase expression. C. neoformans is one of several fungi including that is capable of cause persistent sub-clinical pulmonary disease. We hypothesize that these types of fungal infections have the potential of modifying the cytokine milieu within the lung thereby promoting allergic responses to subsequent antigen exposures. Although the current study demonstrates chitinase induction by C. neoformans in a rat model, similar mechanisms could contribute to the high rates of human asthma in urban areas such as the Bronx. As mentioned, our past studies demonstrated a high incidence of sub-clinical infection in Bronx children well beyond that seen in other areas . It is interesting that such infection parallels the incidence of asthma. We also note that chitin is also major constituent of other exposures that have been linked with urban asthma including cockroaches . Further investigation in human populations will be needed to determine the significance chitinase-like protein induction in asthma pathogenesis. This work was supported by the Parker B. Francis Fellowship to AGV. We thank Dr. Jack Elias (Yale University) for providing rabbit polyclonal serum to AMCase. AGV, oversaw development of immunostaining and immunoblot. He was also directly involved in preparation of manuscript, SN carried out chitinase assay standardization and measurements, ZD carried out immunostaining studies, WYZ infected animals and carried out chitinase and immunoblot assays. JR assisting in immunostaining and processing of tissues. AC assisted in manuscript preparation and development of project. DLG developed project, assisted in manuscript preparation and was responsible for oversight of entire project.